I thought I’d made a good start on creating Indian food with Happy Herbivore recipes – and those are fabulous if you want to keep ingredients and kitchen time to a minimum – but there’s something so rich and satisfying about toasting your own spices and cooking down your own curries. The end result is so much more multi-faceted and a delightful celebration of the senses. 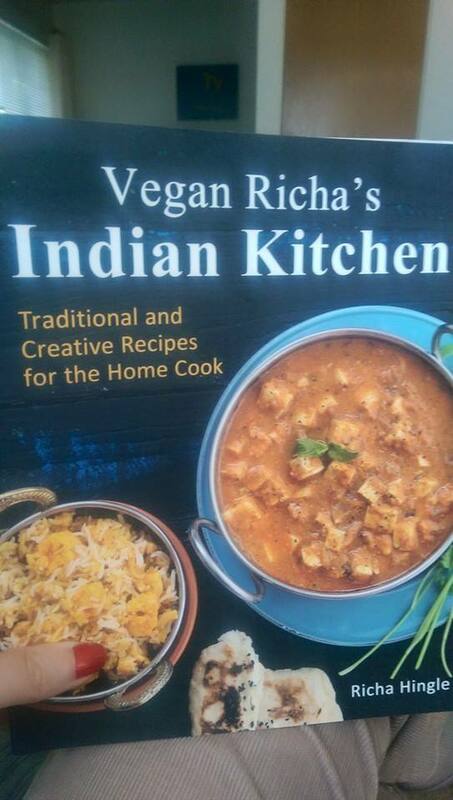 And for those not used to cooking Indian food, Richa’s book offers an informative primer on what you need on hand and the techniques. I don’t have tons of photos of the food I’ve made because it goes directly into my belly before I can think to snap some crappy cell phone shots. 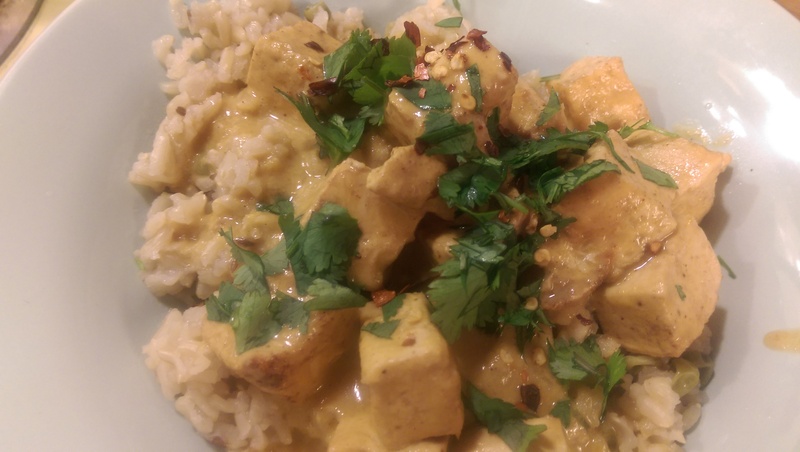 But here’s one of my faves, the mango curry tofu over the cumin-scented rice (the latter of which will be my new go-to rice for batch cooking and freezing). Last week, for my semi-regular ladies’ dinner, I whipped up the mango curry tofu, cumin-scented rice, cauliflower and yellow lentils in mint cilantro sauce, mint-cilantro chile chutney, carrot halwa and – from the bonus recipe back you get for buying the book – yellow lentil spinach fritters and yellow lentil crepes. Everyone loved the dishes. I sadly did not get any photos. I keep meaning to snap shots of my dinners I put on, but then we girls get so busy eating! I’ll try to snap shots and post as I can to continue to show you how awesome this book is – I have some leftover carrot halwa at work (which is basically a pile of carrots, nuts and raisins that tastes like carrot cake – magic! ), so maybe I’ll show you that sometime. Oh and Richa is donating 40 percent of her proceeds to animal welfare causes and for Seattle folk, she’s a Central District homegirl. Peruse the book on Amazon and check it for yourself. While you’re waiting for the book to come in, check out Vegan Richa’s blog, where she posts not only tempting Indian recipes, but indulgent desserts, easy pastas and fun party food.